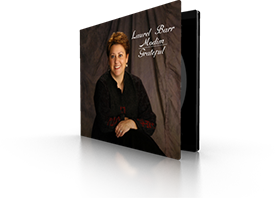 I was playing Laurel Barr’s new CD on our porch when my wife came out and not knowing what CD I was listening to, said, ‘Is that Barbara Streisand?’ Laurel has that quality of voice and expression. She sings with her heart…she sings with joy. What a wonderful CD this is. Creating this CD has been a 2-year process. After finally selecting the music, (which constantly changed throughout the process), we were ready to begin rehearsal. The drawback? The pianist lived in another state! So we packed our bags, instruments, and kids, and flew down to Orlando, Florida to begin rehearsal and the recording process began. Hours of working out the tempo and keys, style and interpretation and voila! It was time to head to the studio. Hour after hour we’d work to add layer upon layer to the song until each one of us was satisfied. The incredible capabilities of the computer allowed the engineer to “pluck” out one note and reinsert another one at a later time. Now that’s technology! With half of the CD completed, we returned home to let our creative juices flow once again and prepare the second half of the CD. I carefully selected other pieces; added to the list, detracted and finally came up with the right mix. Soon after, we flew Allan, my brother and our keyboard man up to Cleveland to finish up this project. And finally this summer, it was complete. From the recording studio, to the photography studio, to the graphics studio, and finally, to the packaging and production company, we had arrived. I now present the finished product, Modim, Grateful to you. My gratitude to all those who participated in this great project; Chad, Allan, Sharon, Marge, Lawrence and Jon, we did it! Thanks for all your hard work. And to those of you, who share in this music, enjoy!!! A magnificent voice that truly smiles, one filled with warmth, heartfelt emotion, and most of all love! Simply a joy to listen to. When I first got my hands on Laurel’s new CD, I was so impressed that it never left my auto tape player for months. We all became addicted to her soothing voice. She’s so contagious – You need to sing along !!!! Laurel, Thanks for sharing your beautiful music with us.